Dell PowerEdge 2900 2950 SAS or SATA Hard Drive Hot Swap Tray with screws. Dell PowerEdge 2900 2950 SAS or SATA Hard Drive Hot Swap Tray. Dell PowerEdge 1900 2950 2970 1950 MD3000 MD3200. Compatible with the following Dell part number Our staff is happy to assist you in any way possible. Our goal is to provide you with excellent products and service! Dell PowerEdge SAS or SATA SCSI Hard Drive Hot Swap Tray screws. Dell PowerEdge OEM 2900 2950 MD1000 SAS or SATA or SATAU Hard Drive Hot Swap Tray with interposer board and screws. KF248 / NF088 / F830C / F449D / Y961C / DJ912 / TJ561 (old style trays). PowerEdge R900, R310, R410, R510, R610, R710, R810, R900, R910. PowerEdge 2900, PowerEdge 2950. PowerEdge 1900, PowerEdge 1950. NEW OEM Dell PowerEdge 2900 2950 SAS or SATA 3.5" Hard Drive Hot Swap Tray with screws. DELL PART # OD981C. This is a Dell Poweredge 2900 2950 2970 HDD caddy marked with 300 GB stickers. Internal Locator: 007NC000. Fits Dell Poweredge 1900/1950/2900/2950 and others. 4 Screws Included. Credit Cards. Dell PowerEdge OEM 2900 2950 SAS or SATA or SATAU 3.5" Hard Drive Hot Swap Tray with screws. DELL PART # OD962C. These caddies support interposer boards, but they are not included. Dell 2.5" SAS Tray Hard Drive Caddy for PowerEdge R610 1950 2950 Servers. This is a lot of 4x Dell Poweredge 2900 2950 2970 HDD caddy marked with 1 TB stickers. The caddies should still work without that bit of spring steel present. Internal Locator: 001NC000. F9541 NF467 H9122 G9146 D981C. Dell PowerEdge 1900 2950 2970 1950 MD3000 MD3200. Compatible with the following Dell part number pls choose the first one. Remarks: any problem will be solved quickly if you choose the first reason. 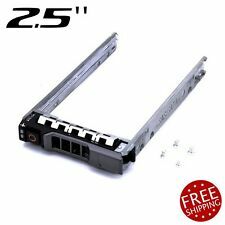 Dell PowerEdge 2900 2950 3.5" SAS or SATA Hard Drive Hot Swap Tray with screws. (Picture shows two caddies just to show top and bottom ). PowerEdge R610 R620 R715,R720 R720xd R810 R815 R820 R910. PowerEdge 2950. PowerEdge 1950. PowerEdge 1900. PowerEdge 1955. PowerEdge 2900. PowerEdge 2970. PowerEdge 6900. Powervault MD1000 MD3000. Poweredge 1950 2950. Our staff is happy to assist you in any way possible. THESE FIT THE OLDER DELL 3.5" CADDIES SAS SATA SCSI (2850 2950). Dell PowerEdge SAS or SATA SCSI 3.5" Hard Drive Hot Swap Tray screws. THEY DO NOT FIT THE NEWER POWEREDGE R SERIES CADDIES. One price is for 28 screws. Dell PowerEdge 1900, 1950, 1950 III, 2900, 2900 III, 2950, 2950 III, 2970, 6900, 6950, R300, R900, R905, T300, T605, 840. 3.5" SAS Hard Disk Drive Caddy Tray for Dell F9541 D981C 2900 2950 T300 SAS. 4 Caddy Mounting Screws. Dell PowerEdge OEM 2900 2950 SAS or SATA 3.5" Hard Drive Hot Swap Trays. 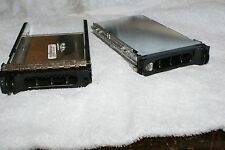 Dell PowerEdge 2900 2950 SAS or SATA 3.5" Hard Drive Hot Swap Tray with screws. DELL PART # OD981C. Dell PowerEdge 2900 2950 SAS or SATA 3.5" Hard Drive Hot Swap Trays with screws.